Inexpensive 10.5" Barcelona Spike Dagger with black handle and brass pommel and guard. Comes with leather sheath. Stainless Steel Blade. Our Agincourt Dagger is named in honor of King Henry V’s famous victory at Agincourt. The Agincourt dagger is the perfect companion weapon for the Agincourt Sword. The Crusader Dagger was originally Designed with a ring pommel so a knight could hand the dagger from a hook on his armour. This beautiful Medieval Replica Dagger is crafted by Art Gladius. This beautiful Medieval Replica Arming Dagger is crafted by Art Gladius. Gladius Medieval style Arming daggers have 440C stainless steel blades, which are fully tempered, but they are primarily intended for use as collectibles. This beautiful Medieval Replica Dagger is crafted by Art Gladius. 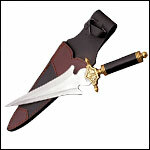 The Cavalry Dagger features a wood handle, brass guard and pommel, and leather sheath. Stainless Steel Blade 6". This Knife has a brown Finish with brass pommel and guard. Comes with leather sheath as shown. The Double Baton with dual daggers offers you different options. The blades are housed together in a hollow baton sheath measuring 26 ½ inches overall. Black with silver pommels. Our Eagle Talon Dagger has a simulated horn carved wire wrapped handle with steel fittings. Guard comes with wicked eagle talons. Double edged split stainless steel blade. 12.5in Overall Length with Sheath. Silver Boot Knife come with silver metal handle and sheath as shown. Overall is 6in. Our Space Dagger comes with a Pakkawood handle, brass guard & pommel. Leather sheath. Overall length 12 1/2 in. Inexpensive Fancy Commando Knife with Black handle, brass guard & pommel. Leather sheath. Stainless Steel Blade 7 3/4"
This inexpensive Fancy Commando Knife has a Simulated Bone handle, brass guard & pommel. Leather sheath. Stainless Steel Blade 7 3/4"
Our Japanese Samurai Braided Leather Night Warrior Katana features sleek stainless wire accents, the hand braided leather grip and sheath. 28" blade. Overall: 38-1/2". Our Gentlemans Boot Knife or often called "sock knives" are sized right for the wearing exposed in ones sock as in Scottish attire and designed to be worn discreetly in or attached to a boot. Our Kriss Blade Boot Knife or often called "sock knives" are sized right for the wearing exposed in ones sock as in Scottish attire and designed to be worn discreetly in or attached to a boot. Our Leaf Blade Boot Knife are sized right for the wearing exposed in ones sock as in Scottish attire and designed to be worn discreetly in or attached to a boot. This Medieval Dagger is adorned with Fleur-de-Lys. Whether worn on your belt or hanging on your wall, it is a wonderful decoration piece. Our Slim line boot knife measures 6.5" overall. It has a stainless steel double edge blade and multi colored wood handle. Our Slim Boot knife comes with a full tang construction. It comes with leather sheath that has a boot clip. Sheath color will vary. Ornamental Viking Dagger measuring 14 inches overall with etched double edged leaf shaped Stainless steel blade. The steel scabbard is accented with gold tones and blue colored gems.